Over 12 years ago, Disability Rights Maryland (DRM) (then known as Maryland Disability Law Center) attorneys, Lauren Young and Luciene Parsley, represented Tatyana McFadden, a sophomore in high school in Maryland. DRM’s attorneys filed a successful federal law suit that granted Tatyana’s request: to compete using her using her wheelchair, on the same track, at the same time, with the rest of her peers on her high school track team. 2 years later, in 2008, Tatyana and her family’s fight for inclusion with DRM’s expert legal assistance, and the support of many others, led to the Maryland’s passage of the Maryland Fitness and Athletics Equity for Students with Disabilities Law. Maryland was the first state in the nation to pass a law ensuring that students with disabilities (1) have an equal opportunity to participate in mainstream physical education programs; (2) receive reasonable accommodations in order to participate, to the fullest extent possible, in mainstream physical education and mainstream athletic programs; and (3) have adapted, allied, or unified physical education and athletic programs are available to them. 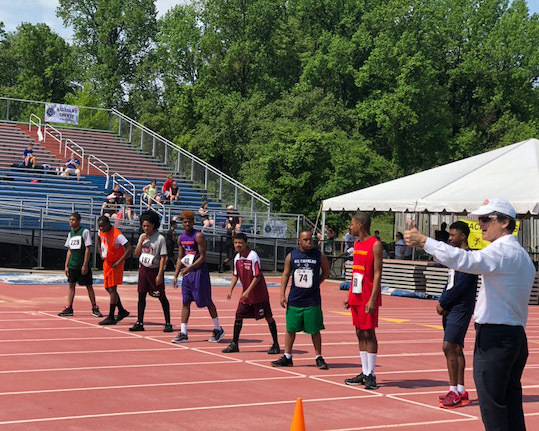 This spring Lauren Young was a special guest at the Unified Sports Interscholastic Track and Field Competition at Prince George’s Sports and Learning Complex to mark the 10th Anniversary of this event in Maryland. Unified Sports® teams are composed of a proportional number of students with intellectual disabilities, with other types of disabilities, and without disabilities who train and compete together on the same team. Over 3,000 students now participate in Unified Sports programs throughout Maryland public schools. This is only one of many examples of the exceptional long term impact DRM’s legal advocacy has made over the past 40 years at for people with disabilities in Maryland. DRM is proud to share that Tatyana was recently named the world’s greatest Paralympic marathon legend, with an extensive list of honors and awards for her achievements all over the world in wheelchair racing.